We feature a lot of boiler stoves on Stovesonline. You can see a list of the stoves on our Boiler Stoves page. Incorporating a wood boiler stove, or wood pellet boiler into a heating system is relatively easy and can be done in a variety of ways. One of the simplest ways is simply to plumb the boiler stove directly in to the existing system. A disadvantage is that you do have to have the boiler stove lit when you want heat, although of course you can easily incorporate the conventional oil or gas boiler already running your system. It is also important to get the proportion of heat which the boiler stove passes to the room right. Too much and you can end up overheating the room. Too little heat passed to the room is not such a problem as we always recommend that you have a radiator in the same room as the stove partly for this reason. You can make a system more convenient by using a thermal store. The heat from the stove is stored in the thermal store as hot water. You can use this heat as and when it is needed, which also means that you can have the heating on when the stove is not lit. Because you are storing up the heat from the stove this also means that you can choose a boiler stove which passes little heat to the room, allowing you to use your stove to provide water for washing and bathing on autumn and spring days when it might otherwise have been too warm to light it. The thermal store can also come solar enabled so that you can link in solar panels to provide hot water when it is sunny. 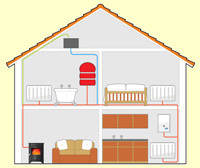 Many other heat sources can also be connected to the thermal store, including a conventional oil or gas boiler as backup. There are a number of boiler stoves available which are suitable for pressurised systems as well as open vented, however many, and certainly the traditional English boiler stoves, are only suited to open vented systems. Don't worry, it is still pretty easy to integrate a stove like this into a pressurised system using a plate heat exchanger or a heat exchange coil in a thermal store. The best starting point is for you to contact us either through our enquiry system, or by ringing our main line which you can see at the top of this page on the right. If you need a stove to run your whole house one of our heating engineers can then perform a heat load calculation for your house which will then allow them to be able to suggest suitable boiler stoves. They can also incorporate a suitably sized thermal store into the system, complete an overall heating and hot water system design for you and liaise with the installer through the job. 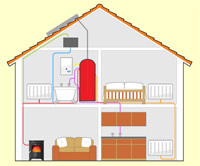 If you do not want to run the whole house from the stove then our engineers can discuss how best to link the boiler stove to your heating system.